Despite all the attempts for several years LG didn't manage to create a middle-class phone with a classic body that would be interesting to the general public. The peak of the sales for the majority of such models falls on the end of their lives that is explained exclusively with the price but not their characteristics. In Cannes the company announced its plans to reconsider its strategy in the European market and to represent a line of new products. And one of the first representatives of the new line is LG G5600. The device has been advertised since the end of this summer and it appeared in the market only in the middle of September. The slogan of the model is "The time to shoot differently". 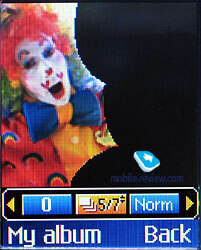 And really, the phone is equipped with a VGA camera and is the first in the company's line (only clamshells were equipped with cameras before). Let's consider this attempt to create a competitive product and we'll start with its design. The appearance of G5600 sticks to the memory easy and no any analogies with the phones by other manufacturers appear, the model has its own face. The top part of the phone is a bit splay and that brings some charm into its appearance. 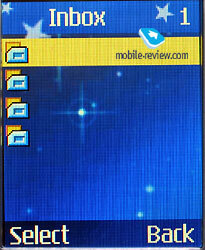 There is a metallized insertion around the screen and it makes the phone look noble. A plastic keypad with gray functional keys makes contrast with the upper part of the phone. They are not so stylish and look plain and perhaps it is the main criticism to the design of the phone. On the side panels silvery plastic alternates with dark gray and the same combination is on the back panel. In general considering the design I'd like to stress that it is not bad for this class and is inferior to the models by other manufacturers in nothing. The dimensions of the phone are traditional for its class (105 x 43 x 19 mm) and its thickness is a bit more than other models have. The weight allows to carry the phone comfortably without paying attention to it (90 grams). At the same time the device is not so heavy in hands as it may seem. 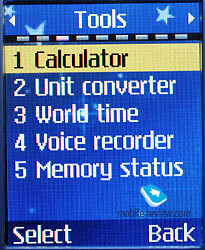 The screen is TFT 65K. 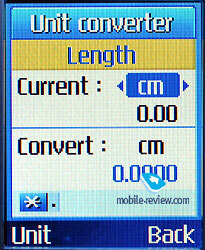 Its resolution is 128x160 pixels and that allows to display up to 7 text lines and one service line. In the majority of previous models the screens were too bad even for critics despite the characteristics announced by the manufacturer. 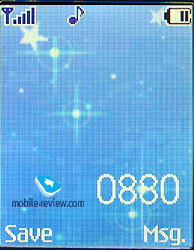 For instance, the same 65K by Samsung looks many times better. And speaking about LG G5600 I may say with pleasure that the situation has changed. 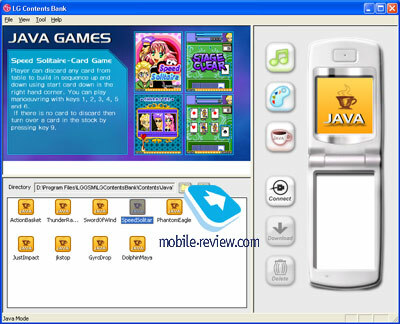 The model has a qualitative screen that is quite comparable with similar ones by other manufacturers. It is inferior to the best screens in nothing and information on it is read well in the sun. 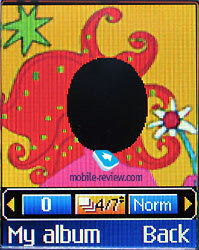 Due to the fact the body hides the edges on the screen an impression of the depth of the picture appears. 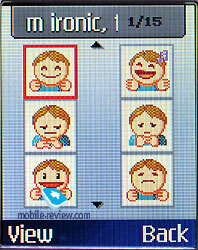 It is a very curious effect and makes it more comfortable to use the phone. 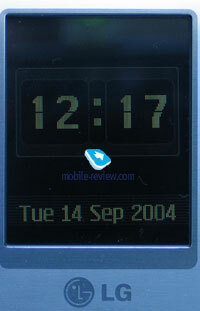 The screen turns off in the standby mode but it still has a digital clock like screen saver with a date, it looks nice. 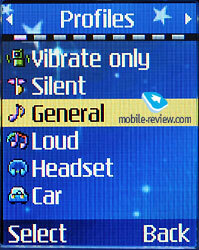 A navi button is four-positional and very small in size. A feeling of discomfort appears when working with it, thus scrolling a list in two directions you may feel that the distance between the ends of the button is too small. It would be possible to set a normal button considering the free space but for some reason it was not done. 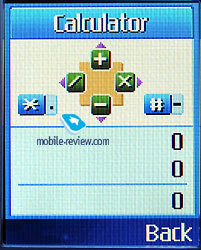 Functional buttons are also microscopical, especially C button and a special button for the camera. And if the second point is explained with the presence of a normal button on the left-side surface the dimensions of C button may be considered a big disadvantage. Digital keys have a terrace-like disposition, the comfort is average or even less. The keypad needs improvement in this model. I'll note that it is more comfortable than in exotic designers' solutions but is inferior to the majority of usual devices. 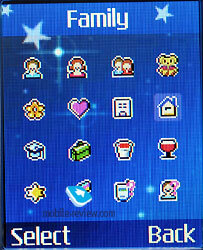 There is a blue backlighting and characters on the buttons are seen well not in all the conditions. A service indicator may be seen under the keypad, it is placed almost on the edge and is shifted to the right. There is an interface connector on the bottom end of the phone and a strip hole on the top one. So, the thing that is left to say is that there is a connector for a handsfree headset (it is included into a delivery kit) on the left-side surface, it is covered with a rubber curtain. There is the VGA camera on the back panel and a small mirror. Having taken the panel off you'll see a Li-Ion battery, 950 mAh. According to the manufacturer it works for up to 250 hours in the standby mode and 3.5 hours in the talk mode. In Moscow the device worked in average for 3 days in case of 50 minutes of talk time and up to 30 minutes of using other functions. The result is characteristic for the devices of this class. Full charging time is about 2 hours. 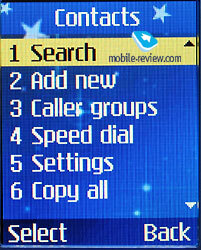 The main menu is represented by three rows of icons and all of them are different to previous models, this is a renewed style of the menu. 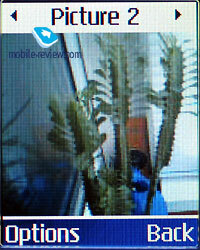 The pictures are qualitative and look good that makes the device pleasant to use. Submenus look like lists and the items that may not be disposed on the screen are scrolled automatically in a horizontal line. There is a fast navigation with the help of digital series. 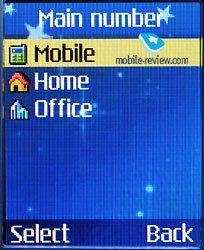 Also it is possible to choose up to 9 functions for a personal list that is called by moving the navi button down. Phone book. There is a possibility to save up to 200 names in internal memory, up to 5 fields for a name (4 numbers, one e-mail address). 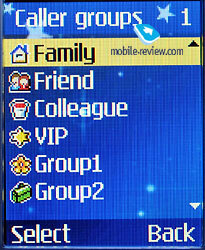 Also you may choose a users' group and an icon. 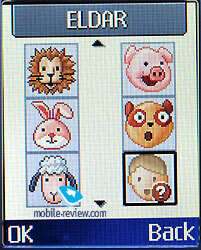 The icons are preset pictures of people faces and animals. 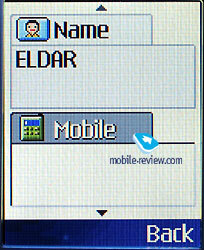 During the call a chosen picture will be displayed besides a name on the screen. There is a possibility to assign a photo to a name but it should be saved in a minimal size first. When entering your data you'll have to choose the main number and only then add others one after another, by the way, some of them may be missed. The total list may contain both numbers from SIM-card memory and from the internal one. 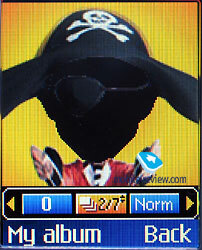 Also an assigned picture may be displayed opposite to a name. There are 7 users' groups and it is possible to set a personal melody and a picture for each one (that is another set of pictures). Messages. There is a support for EMS that allows to attach melodies, pictures to messages, format text and send concatenated messages. 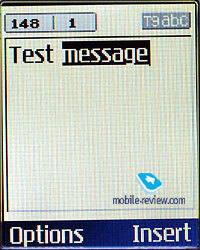 The phone supports predictive text input T9 (a possibility to add your words into the dictionary). There are several dictionaries for different languages and up to 6 editable templates. 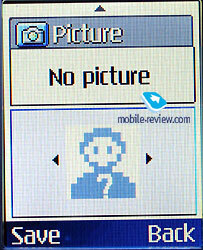 The device supports MMS and the company made it possible to format several pages, insert several pictures instead of one. 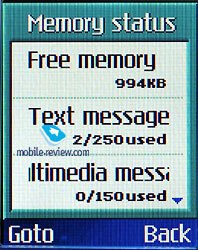 All the messages are stored in the internal memory, first SIM-card memory is filled with SMS and only then the internal one is used. 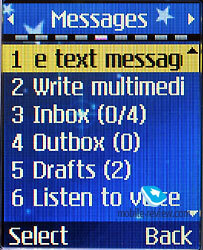 In general it is comfortable to work with messages, the device is up-to-date. Call lists. 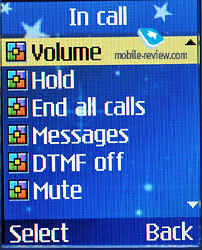 Here one may view standard lists of outgoing, incoming and missed calls. 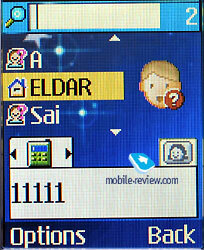 Each one contains 10 numbers, for some entries date and time of the call are specified. Similar numbers are summed up but not displayed in order. There is a general call list, 20 last entries from all the lists are summed up there. 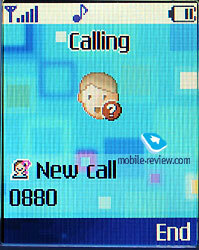 And it is this list that is displayed when pressing the Call button from the standby mode. Profiles. All the sounds may be adjusted from here, from a call signal to a key press sound and alert type. Everything is traditional. Settings. 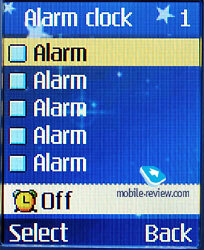 Phone settings such as the screen, call signals and what is the main alarm clocks are adjusted from this menu. 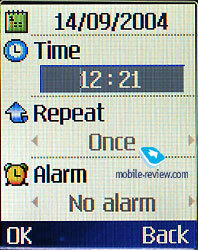 There are 5 of them in the phone and each may be set for once, everyday and every week. 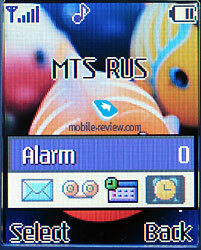 The presence of such a number of alarm clocks will satisfy even the most demanding user. Organizer. 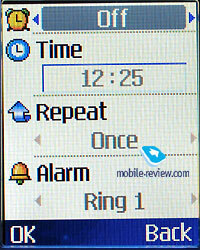 It is possible to save up to 20 events in the organizer and a date and time for the alert are set. You also may set it recurrent (every day, week, month, year). 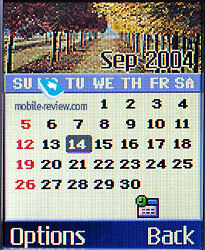 Calendar displays the whole month, the dates with set events are distinguished with another colour and a sign indicating the type of the event (meeting or a memo) appears in the bottom. The main minus of the organizer is a limited number of entries. Tools. Here is a standard calculator, a unit converter, world time function and a dictaphone (works only in the standby mode with up to 19 seconds for a record). 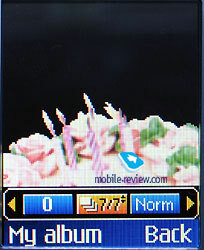 A general memory status may be viewed from this menu. Downloads. Downloaded images, melodies and programs are stored in separate folders. All the folders in a new phone are empty. Service. The device supports GPRS class 10 that is why I'd recommend to adjust wap-browser using batch communications, that will be cheaper. The only thing to add is that the wap-browser is 2.0 version. The thing that disappointed is the absence of history, it is often necessary to enter the same address again. Downloading melodies and pictures makes no troubles and the same for applications. Camera. 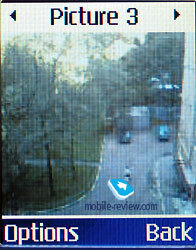 An integrated camera allows to take photos with several resolutions, they are 48x48 pixels (used only in the phone book), 160x120, 320x240, 640x480 pixels. File format is JPG, it is possible to choose a compression level and quality (high, medium, low) for all the resolutions except the maximum one. 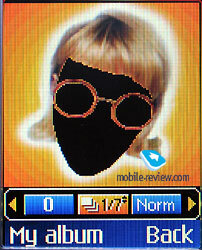 The quality for 640x480 is only low. 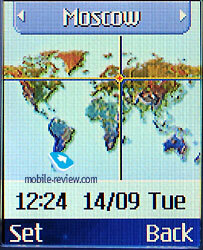 The screen serves as a viewfinder in the shooting mode. There is a tool panel on the left and there you may choose the main parameters for shooting, it is particularly comfortable to do that using a side button for volume level adjustment. Not all the chosen settings are saved till the next shooting, one has to adjust them again and it is a slight disadvantage. The photos may be black and white, colour and also Sepia effect may be applied. There are 5 light levels and x4 zoom. One of the preset frames may be used when shooting, that is, for instance, combining a friend's face with a body of a pretty girl or a body-builder. In general the photos are not bad. 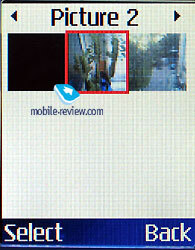 And by the way there is a possibility to view photos as icons and having chosen one you may see it in a full screen size. 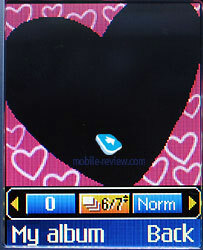 The taken photos may be used as wallpapers for the internal screen. 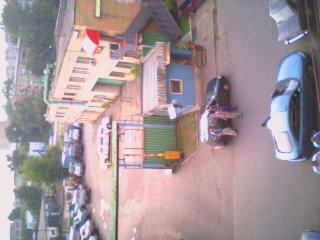 The quality of the photos on the screen of a PC is not so bad but also not very good. If to compare with similar products by other manufacturers the camera by LG is average in characteristics. Synchronization with PC. Besides synchronization via a cable the manufacturer provided a wireless one via IrDA. The settings are rather trivial and everything works without troubles. There is a wide range of melodies, pictures for the screen in the standby mode (wallpapers) besides Java programs on the disk. There is a possibility to synchronize phone book and organizer entries with a PC, there is synchronization with MS Outlook. The total score is rather low that shows not high productivity of the processor and memory subsystem. 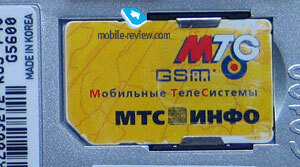 For a comparison Siemens C65 got a score of 98, Motorola C650 – 58. That is clear that such a productivity is characteristic for the previous generation devices but not current, an old platform tells upon. The model rouses no cavils as for the quality of the connection, the device works well. The volume level is very high and it should be set lower sometimes. 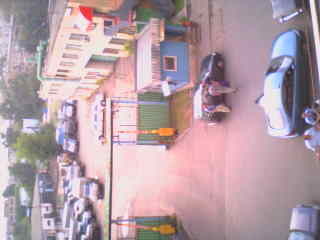 The volume of the 40-tones polyphonic alert is high and the device may be heard in the street well. As for the melody, the device is not as good as 32-tones models by LG, call signal sound louder but ruder. The appraisal is subjective and the difference may be noticed when the two devices are compared. The power of the vibrating alert is medium and there are no any peculiarities. 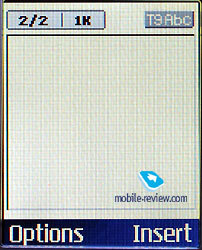 Functionally the model is based on LG G5400 like many other phones by LG. That device is some kind of a founder of he line in 2004. For its time the model was successful but the specifications should change with the time, shouldn't they? The main cavil for me was the size of the memory available to a user that is only 1 MB. 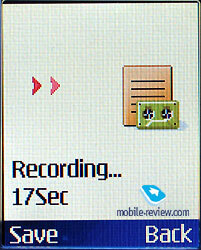 Yes, it is true a middle-class phone equipped with an integrated digital camera, Java, a dictaphone has only one megabyte of memory. I'll stress that there is no any preset Java applications, many templates and any preset content. Just to understand how little memory the phone has it is enough to say that only 20 photos may be saved in the internal memory with the maximum resolution in the beginning. And due to the absence of any ways of synchronization with a PC (a cable is not included into a delivery set, IrDA is absent) there is nowhere to store photos in the phone. The thing that remains unclear to me is why the company equips its middle and high class phones with such memory size. 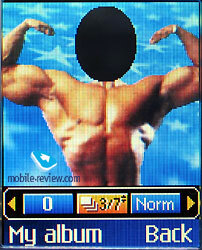 Technically, greater memory capacities may be realized on this platform and the price will change for 5-6 USD not more. And the company continues setting a limit for organizer entries that is not great also. 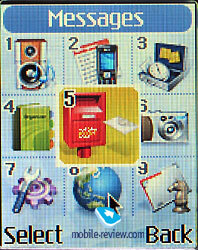 Traditionally up to 20 tasks may be saved in the organizer. 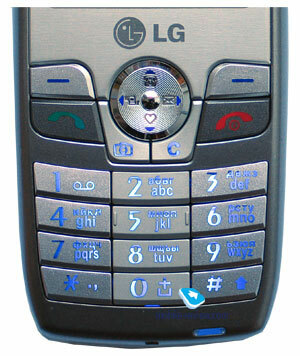 LG G5600 had all the chances to become very popular. But limits on memory size, the fact that IrDA is partly absent make it impossible, the device will remain a niche solution. 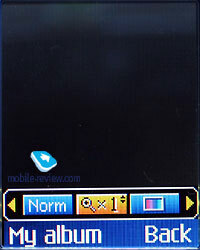 And it is a pity because the interface got more convenient. Localization still has some faults, but they are not so evident and there are no abbreviations. The model doesn't have many problems and the majority of functions works well. 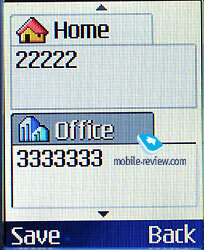 Often when changing a coverage zone of a basic station the phone reregisters loosing the network. That happens not very often and the majority of users doesn't pay any attention to such a behaviour of the phone. 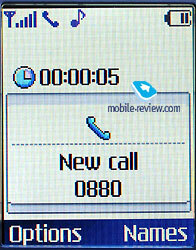 The design, good screen and a well thought-out interface may be referred to pluses of the phone. 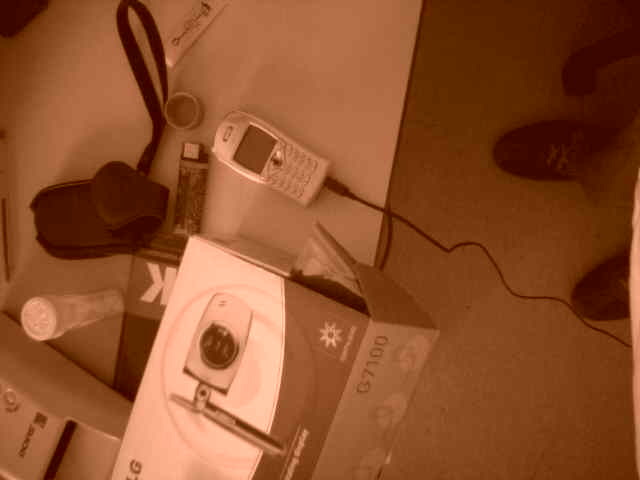 The keypad, memory, the absence of IrDA which got standard in this class, the absence of a loud speaking mode are evident minuses. The device looks an expensive solution with the price of 190-200 USD. It may be recommended to those who demand a good screen, melody, design but don't need extra possibilities. 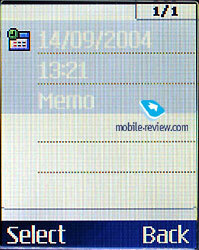 The rivals are Sony Ericsson T610 (much better functionally but the screen is worse), Philips 535 (similar in functions, Java is absent, many voice tags and more memory, the screen is worse), Motorola C650 (the screen is worse, more functions), Siemens C65 (the screen is smaller but the quality of the picture is comparable, much more functions). The price/quality ratio for LG G5600 is low, the device gets attractive when the price is 150 USD (and it is for the current moment). 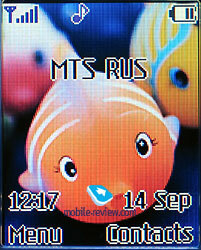 We are grateful to Alt Telecom for the provided mobile phone.